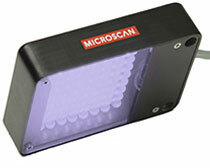 Addresses a broad range of applications via light positioning in bright field or dark field. The Area Array Illuminators general purpose, unidirectional design (adjustable via mounting position) may be used for dark field (creating shadows and specular reflection) or for bright field lighting for diffused surfaces. As with other incident lighting choices, subtle adjustments to working distance and angle of light delivery can deliver good image contrast for minimal investment.